One of Portland’s most famous landmarks is slated to soon be destroyed. Ok, not exactly destroyed, but rather defaced in such a way that Civic pride in it will decrease significantly. It is important to submit all evidence to the Landmarks Commission. City Council will not accept additional evidence if there is an appeal of this proposal. Ramsay Signs, who owns and maintains the sign, has proposed alterations to the sign, including removing the existing (Made in Oregon) letters, and manufacturing and installing new (University of Oregon) letters. The proposed letters would be in a similar cursive font to those being removed. The construction and illumination of the letters would be similar, with 4-inch-deep aluminum pan channel letters, double-tube neon, and chasing incadescent bulbs. Zoning/Description: CXd, Central City Plan District, Skidmore/Old Town Historic District, Historic Landmark. So essentially the sign changes from “Made in Oregon” to “University of Oregon.” I have a huge problem with this as “Made in Oregon” is more generic and uplifting then “University of Oregon.” Yes the “Made in Oregon” store is gone from that building, but I think it’s current wording makes a much better sign for Portland to be proud of. I apologize to University of Oregon alumni who might disagree, but this sign will significantly change the character of Old Town. We still have several months more to enjoy the sign, but here it is before it’s gone. this is the dumbest thing i have ever heard of! The University of Oregon is going to be the main (only?) tenant of the Natio building. This is for their Portland Campus which will include adult and continuing education services. This I think is a very good thing. I just wish they wouldn’t change the sign. I disagree with this sign change. It has been there for as long as I can remember (I am 17), and it remains a landmark and a positive addition to the Portland skyline. Changing it to support one of two major State Universities is just ridiculous. I don’t think the company is taking into consideration the thoughts of the city. Which isn’t surprising, seeing as though they’ll probably get some big money from U of O for the advertising. But that shouldn’t matter. We need a place where the Corporations don’t own everything, and the people still have a say, and Portland is the perfect place for it. I don’t think we are doing enough to stop this, and I think this should change. People have to stop laying around and waiting for someone else to do it, everyone who is against this sign change should stand up and say so. U of O needs to stay in Eugene. We don’t go to their town and take over their sign’s. 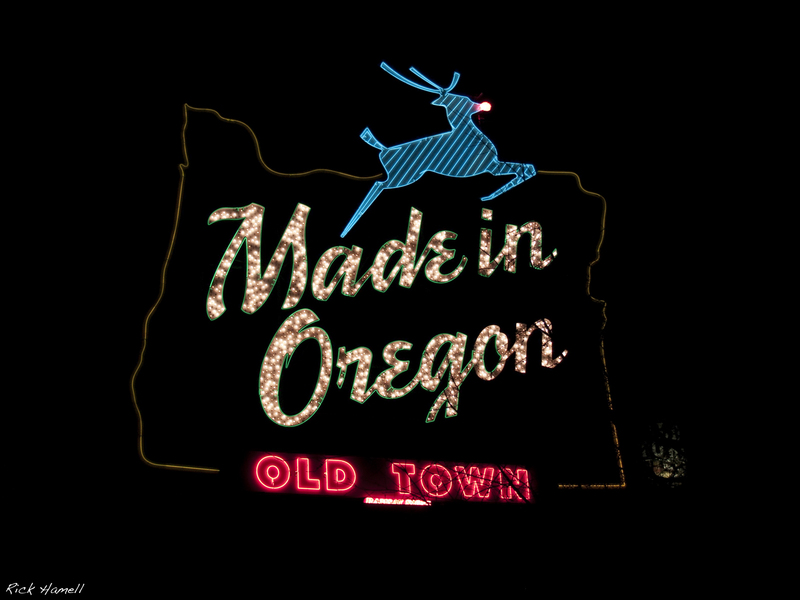 The white stag made in Oregon sign sould stay the way it is. damn that is so sad. i love that sign and it is always a warm feeling when i visit portland one of my favorite cities. university is terrible. they have their campus for that. this is really sad and i can’t believe people would let this happen. 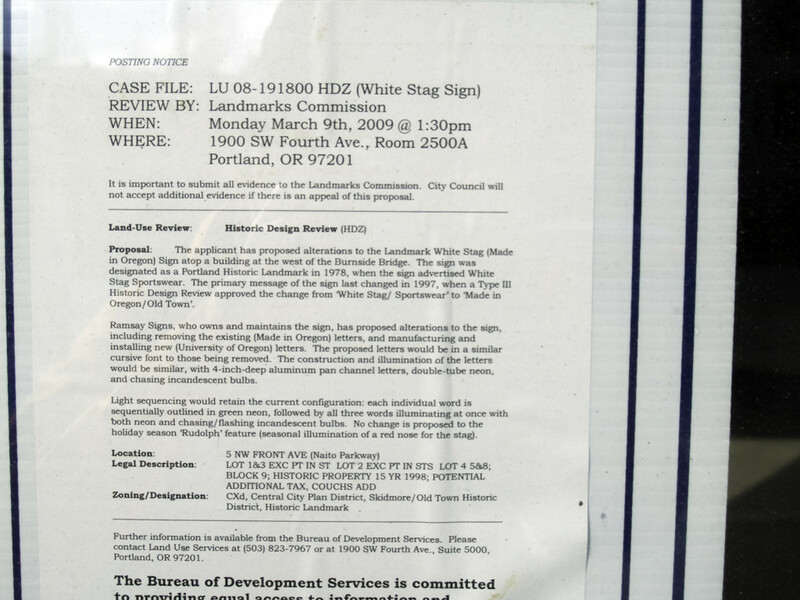 I was just announced today (March 22, 2010) that the City of Portland will be taking over the sign completely. They’re still going to modify it, but it’ll simply say “Portland Oregon” instead. But at least it’ll still be up.